Part 3 of the Top 25 Albums Of 2007. These were some of the ones shuffled around the most as I worked and reworked the final list. Stayed tuned for some giveaways in conjunction with the top ten getting posted. While I liked a few of their older songs their albums felt like a lot of filler, this one delivers from beginning to end. New Pornographers sound more like a band than a “supergroup” on this one making it their best album yet. I have to add though, the live show I saw, even with Neko and Dan Bejar in tow, was a bit disappointing, good but not great. Bruce pulls the E Streeters in for one more go around and makes what is his best rock album since Born In The USA. Although not as direct as John Fogerty on Revival he manages to deliver his own political agenda as well. The Phil Spector-ish Girls In Their Summer Clothes may be the best single of the year. Spoon sounds like no one else. To me it’s not as immediate sounding as their last, Gimme Fiction, but still filled with great pop songs. You Got Yr. Cherry Bomb and The Underdog are instant classics. If Chris Martin of Coldplay had the same Springsteen obsession that Win Butler of Arcade Fire has, it would probably sound something like Philadelphia’s A-Sides. Expansive and dramatic without the overkill, they’ve created a shimmering, beautiful record that solidifes their place as a band on the rise. The warm intimate folky feel of the disc is something that immediately grabs you and transports you to another place. Delicate hypnotic percussion, soft strummy guitars, a sprinkling of other ambient sounds all woven together by Sam Beam’s softspoken vocal style, create an almost spiritual vibe to the whole thing that is just mesmerizing. 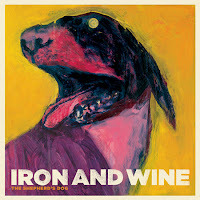 I’ll admit I’m somehwat chasing the bus on this one, as the new Iron and Wine album has been out for a couple months now yet somehow I managed to avoid hearing any of it until this past weekend. The dozen songs on The Shepherd’s Dog are a fantastic blend of warm hypnotic percussion meshed with softly picked guitars and keyboards, all strung together masterfully by Sam Beam’s vocals. Boy With A Coin is the first single from the album and I haven’t been able to get it off repeat the past few days. The handclaps woven into the percussion give it such a spiritual mesmerizing feel that I just can’t get enough of.